This summer, Ibiza is entering its exciting new chapter with the hugely anticipated launch of Hï Ibiza coming from the Ushuaïa Entertainment team. The site Space once called its home has been taken over, given a fresh new look and has been graced with the most advanced sound on the island. For the entirety of the summer season, Hï Ibiza will be host to some of the finest selectors from the electronic music scene. One of these selectors is electronic dance champion Eric Prydz and he has just announced that for two shows only he will be joined by canadian superstar, Deadmau5. Deadmau5, aka Joel Zimmerman, is something of a myth on the white isle. Despite his status as a household name, constant headline performances at the biggests festivals in the world and being a mainstay on the international dance scene, the six-time GRAMMY-Award nominee has played only a few select shows in Ibiza over recent years. 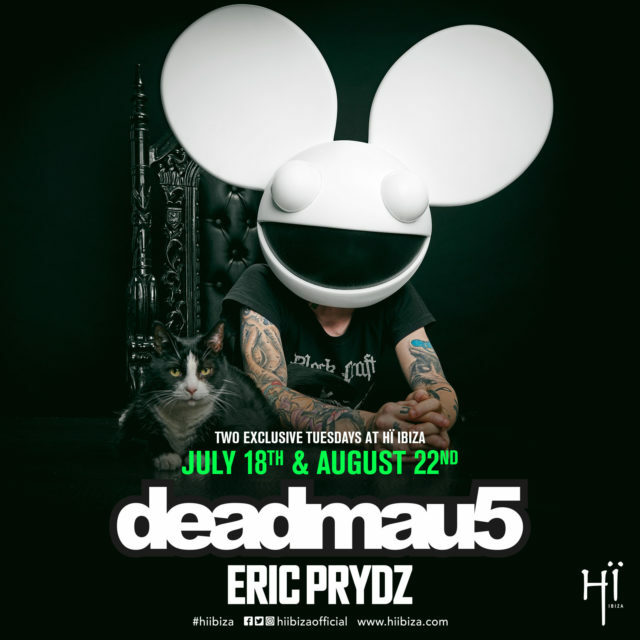 It comes as no surprise that for the 2017, Eric Prydz is heralding the return of Deadmau5 to the island for the first time in 3 years. With Hï Ibiza being a blank canvas for all the artists involved, Eric Prydz will also be curating his line ups with guest acts such as Dusky, Kölsch and Pig&Dan alongside the exclusive shows with Deadmau5. Zimmerman’s shows with Prydz at Hï Ibiza will be his only dates in Ibiza this summer, playing in the Main Room on 18th July and 22nd August.